This article is about Mario's Special Shot in Mario Hoops 3-on-3. For the custom variant for Bowser's Fire Breath special move in Super Smash Bros. for Nintendo 3DS and Super Smash Bros. for Wii U, see Fire Breath § Super Smash Bros. series. 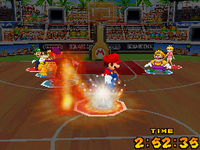 The Fire Shot is Mario's Special Shot in Mario Hoops 3-on-3. To perform it, the player must tap out the letter M twice. The M stands for Mario. Mario initiates the move by lighting the ball on fire and dribbling it in a vertical M shape. 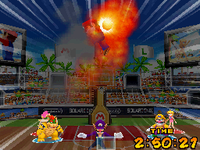 Once initiated, Mario will throw the ball with one hand towards the hoop with red flames trailing behind it. If shot from inside the 3-point line, the ball will land in the hoop with a fiery explosion. If shot from outside the 3-point line, the visuals don't change, but a teammate needs to grab the ball and dunk it in. This page was last edited on September 27, 2018, at 14:47.